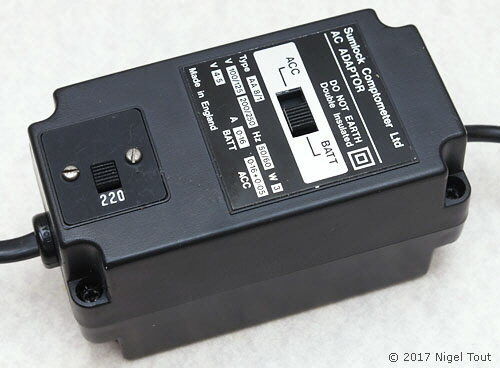 Calculator AC adaptors are usually not very interesting, typically being just a small black plastic box housing a transformer and a rectifier plus capacitor and a connector to plug into the calculator's adaptor socket. However, the ANITA AC Adaptor has an unusual feature which may be unique. This is the ability for it to power the calculator from the AC supply while the calculator is fitted with non-rechargeable batteries. With most calculators this is not allowed since the AC adaptor will start to charge the non-rechargeable batteries with dire results. 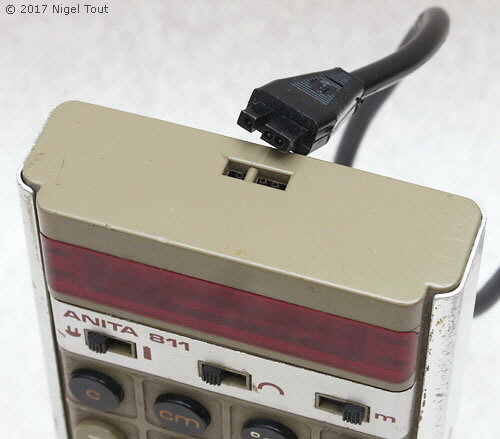 The ANITA AC Adaptor overcomes this problem by using a three-pin adaptor plug and extra switches; one on the calculator and one on the AC adaptor. 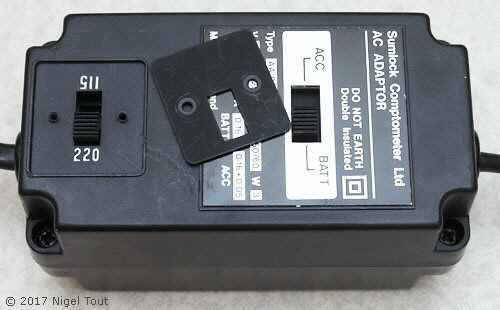 ANITA AC Adaptor showing the AC voltage selector switch and the unusual ACC/BATT switch. The AC voltage selector locking plate has been removed to show the two voltage settings. The ANITA 841 instructions say: "When you receive your adaptor/charger, first make sure that the voltage plate is correctly set for your own supply voltage. The switch should be in the 220 position for any supply voltage from 200-250 volts AC, the 110 setting is suitable for any voltage in the range 100-150 volts AC." The plug and socket used by the AC Adaptor use a bespoke 3-pin design to allow the calculator to be powered up using the AC supply while disposable, non-rechargeable, batteries are fitted to the calculator. In that case the AC Adaptor must be set to "BATT" and the switch on the left of the calculator must be set to the 2-pin plug icon, and NOT the battery icon (see the chart below). An ANITA 811 calculator being powered by its batteries, as indicated by the switch on the left being set to the battery icon. With no AC Adaptor plugged in, the calculator is actually turned off when this switch is set to the 2-pin plug icon position. The ANITA AC Adaptor can be used with most of the early ANITA hand-held calculators. There are operating manuals for several of them in the Operating Manuals & Leaflets section. Chart showing the appropriate switch settings for use with calculators fitted with Disposable batteries or Rechargeable batteries (from the ANITA 811 instruction manual). Line 1: the calculator is powered up for use from the AC. Line 2: the calculator is powered up for use from the batteries. Line 3 and Line 4: this is an incorrect setting since the AC Adapter is trying to charge disposable batteries which are not rechargeable, which may have dire consequences. Line 1: the calculator is set for running from the adaptor and AC supply. Line 2: the calculator is set for running from the batteries. Line 3: the calculator is not powered up, but the batteries are being charged from the adaptor and AC supply. Line 4: the calculator is powered up from the batteries, and the batteries are also being charged from the adaptor and AC supply. However, the drain on the batteries is greater than the charge being provided by the adaptor so the batteries will slowly discharge, which means this is a pointless setting. 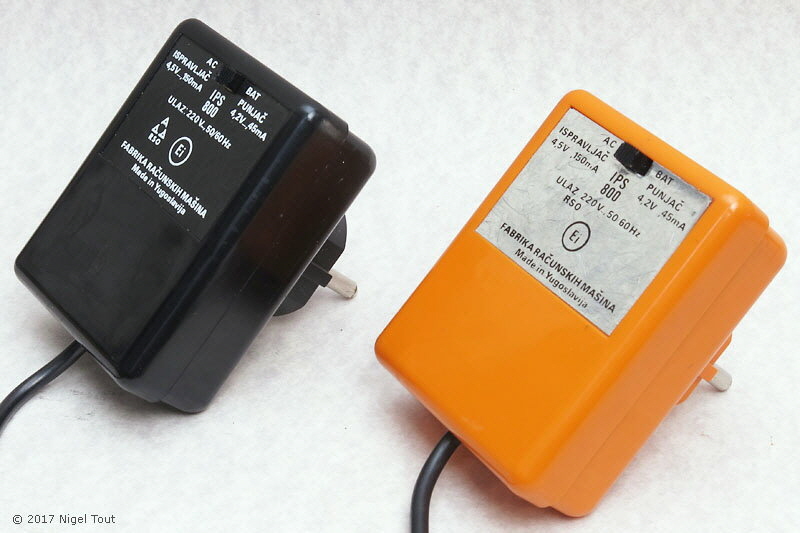 These are AC Adaptors manufactured in Yugoslavia from about 1976 when the designs and tooling for the ANITA hand-held calculators were sold for manufacture by the company Elektronska industrija-Niš. These adaptors, which plug directly into the AC supply socket, retain the "AC/BAT" switch and the three-pin bespoke adaptor plug and socket, but do not have the AC voltage change switch. Some of the models with which these adaptors were used are featured on the "Models Derived from ANITA" page.